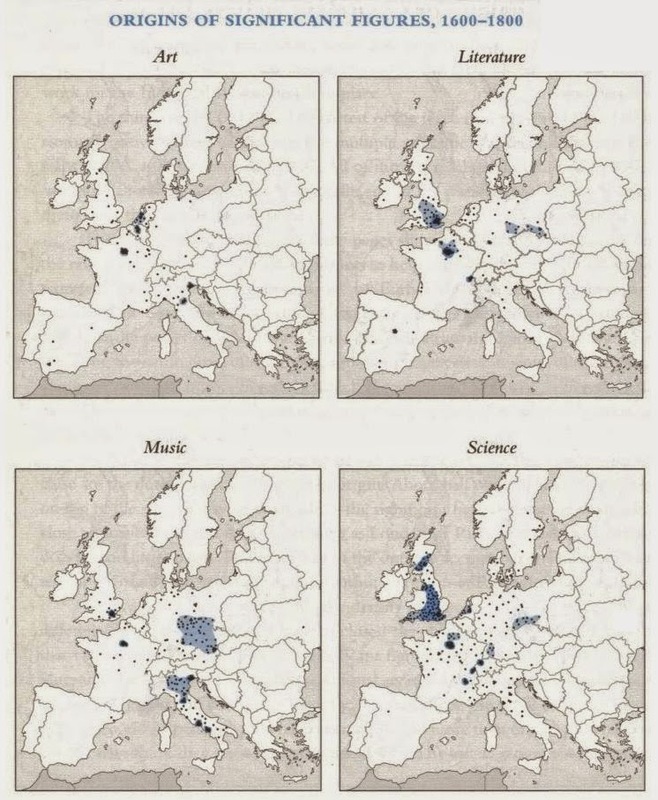 Both art and music seem to follow the centres of patronage (the Low Countries and Northern Italy in the Late Middle Ages). 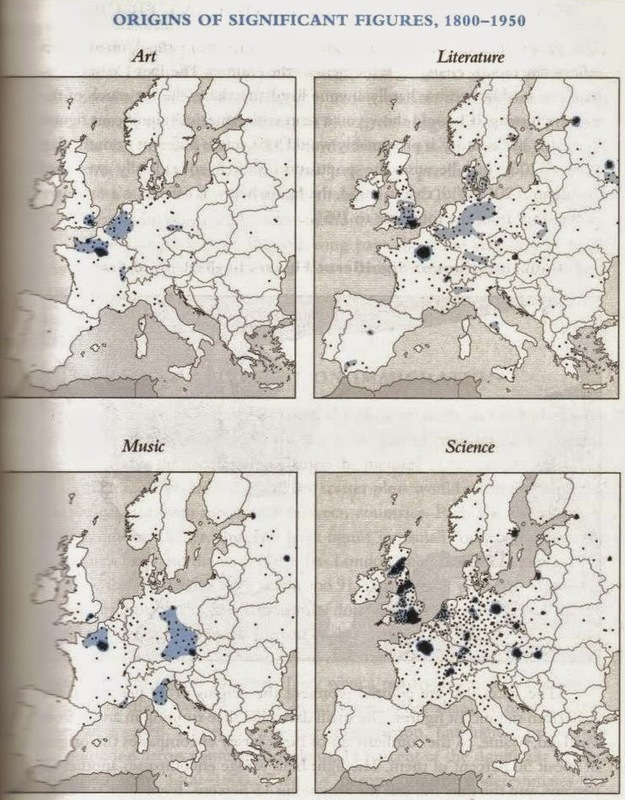 Literature and especially science seem more distributed (except for the upsurge in Britian in the 19th century). Charles Murray? Not a good source. Why half of Poland is in Germany borders (in one case whole Poland)? 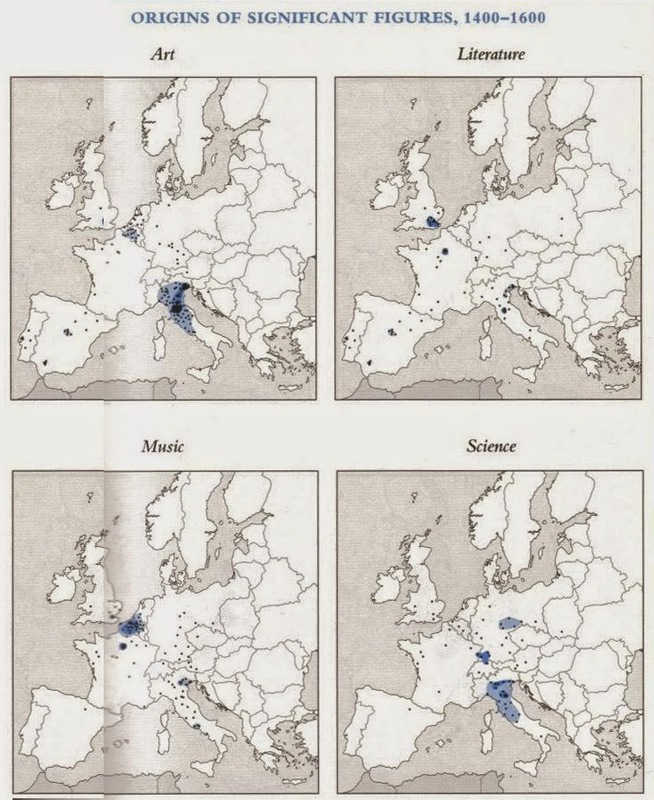 So, the size of Germany depends on whether you look at it as art or literature. Plus: isn’t literature art? "...half of Poland..." Learn some history before you show your ignorance. For hundreds of years Poland has not existed as a country. Wow, these comments are kind of ridiculous. You guys don't need to worry so much about the choice map, just appreciate what it's communicating. A lot of Murray's work is about varying intelligence in different people groups. The lines on the maps are not perfect, but they are sufficient as cultural boundaries. The ad hominem toward Murray is totally unnecessary. And come on, the fact that the first Literature map is different is just a editing mistake. C. Murray forgot a list of Greeks, who influenced Europe and I'm not talking about the ancients. First entry is Cardinal Bessarion from Trebizont (1403-1472)Renaissance scholar, another one is Demetrius Chalcocondyles(1423-1511)from Athens,who fled to Italy after the ottoman conquest. Doménikos Theotokópoulos or El Greco(1541-1614), painter from Crete, who was well known in Spain.Another dot is missing from Crete and represents Nikos Kazantzakis(1883-1957),anyone who doesn't know Zorba the Greek?